1 The first electric train service in the Netherlands was opened in 1908. The line ran from Rotterdam to Den Haag. 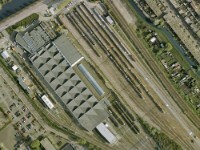 A special maintenance plant was built near Leidschendam. Originally the line had its own power supply on this location. The plant still exists today, be it as a part of NedTrain's nationwide maintenance network. The Open Day of 2008 was to commemorate the 100 aaniversary of its existence. 2 When I arrived I had only just about one hour left. Photo's were taken in a hurry. Sorry. 5 Three post WW2 series on a row . Left an electric four car set of Mat '54 (Mat is short for Materieel, Rolling Stock; '54 is the year this series was first ordered/built). Middle a three car diesel Mat '64. Right a two car electric Mat '64. Many of the latter are still in their last years of operational service. The 419 is already a museum set. 12 42 Diesel Three of the Mat '64 generation were built between 1960 and 1963. Every set had a characteristic motorcar which was available for passengers for only half of its length, the other half being occupied by its 1000 hp strong diesel motor. They were in regular service until about 2000. 15 sets were refurbished in hopes for new services during the year 2001. These envisaged services didn't turn up though.The rebuilds saw some minor services until late 2003 but were eventually set aside. The Diesel Three on this photo is a refurbished one in its original 1960 livery!! 15 The characteristic motor car with its three "portholes". The square box is the airco unit which was added during the refurbishment. 16 Electric two car set Mat '64 no 419. From 1966 till 1976 the two car sets were built in several batches, numbering 246 sets in all. Some 200 are still in service today, the first two batches being scrapped plus some casualties. 23 mDDM motor car with, take a good look, yes three trucks. The middle truck can move sideways. Despite technically being a locomotive (replacing the original 1700 series locomotive) the mDDM can carry passengers and is usually referred to as a motorcar. 27 Three generations of NedTrain shunting power. First the latest, the 700 series (13 examples), entered service from 2003. It is a version of the Vossloh G400B. I saw it designated by hobbyists as "the Bonsai 6400". 28 Note that the coupler can be raised to accommodate a correct coupler height for any type of rolling stock. Ugly but effective. 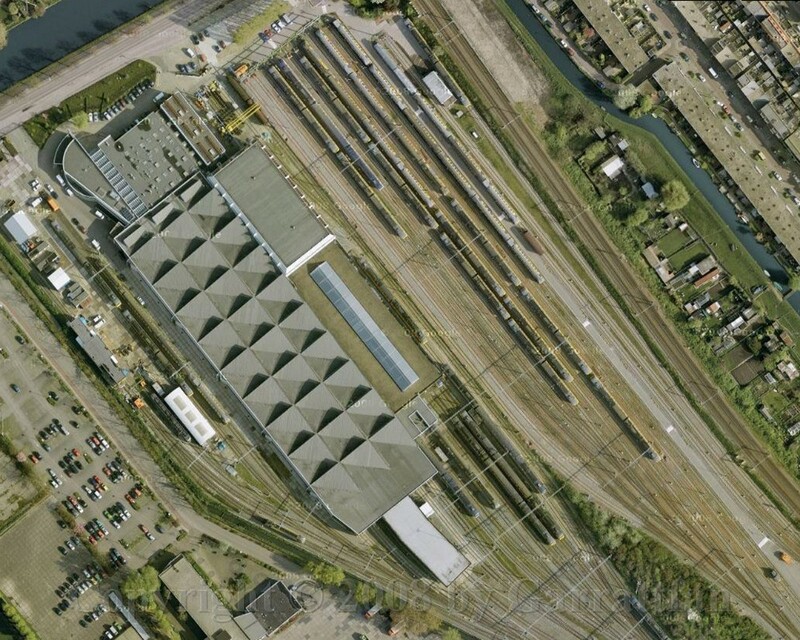 32 A Werkspoor pre WW2 highly unsilent example. This design was concepted in the thirties and the designers clearly worked with the steam loccomotive pattern in mind. Picture a boiler instead of the motor cover and you'll see a steam loco. They were built in large numbers and only recently the last have been withdrawn from active service. Due to its characteristic whistling exhaust it was nicknamed "whistle kettle"
37 Couplers. Every car has only one truck and rests on another car on the truckless side, hence the couplers do not only transmit the horizontal and lateral forces between the cars, but also the vertical forces. 38 The tiny motor unit. The "hovering" truckless sides of the adjacent cars can clearly been seen here. 39 RandstadRail is a Lightrail initiative between Den Haag and Rotterdam, upgrading the now 100 year old connection. 46 This is the successor of the aging fleet of Mat '64. Test runs are being made todate and 35 sets have been ordered with an option on 5 further batches of 32 sets. 48 The Jakobs truck: two cars rest on one truck only, saving on material and maintenance and giving better riding behaviour. 54 Trying to get a more artistic view. Light didn't suffice to get the entire scene crisp and sharp. 59 In the middle a Mat '46 two car electric railcar. This one is still operational and occasionally driven by an ex-collegue of mine. 60 The Mat '46 design was largely based on pre WW2 designs. Time for extensive innovation failed as there was a huge need for rolling stock to get electric operation going and de-steaming underway again. Between 1948 and 1952 65 four car sets and 79 two car sets entered service. In 1983 the last of them were withdrawn. Only 273 escaped the cutter's torch. 64 The spartan interior of Mat '54. I rode on them in my younger years and seeing these doors was a first meet since almost thirty years. 72 And the air conditioning. Imagine the this car in summer's blaze. Maybe you can now guess why these cars had silver rooftops!! 80 A scale model of the 3900 series steam locomotive. Put in service in the early thirties these engines were one of the last series designed for the Dutch Railways. Electrification plans were concepted as early as 1922, aiming the end of steam operation around 1943. It was decided at the time to stop building new steam locomotives by 1925. Development of suitable electric locomotives lagged behind though, thus necessitating the availability of new steam power. These were subsequently built between 1928 and 1932. The world economic crisis hindered serious deployment of their powers and the 6300 and 3900 series never got the share of work they were intended for. The last 3900 was scrapped in 1957, still in its mid-life. Main steam in the Netherlands ceased in January 1958. 82 A model of Mat '24, the first electric series that resulted directly from the in 1922 concepted electrification programme. Some examples of this type are still operational to date but I haven't seen them on this open day. 85 This is the type were it all started with: the electric railcars that operated the Den Haag - Rotterdam line from 1908. One motor car is preserved in the Dutch Railway Museum in Utrecht in immaculate but non-operational condition. 86 Wel, to conclude this photo tour one last view of the Sprinter LightTrain, the newest generation of rolling stock in the Netherlands, proudly standing on the new built maintenance tracks, the latets extension of Leidschendam's maintenance capabilities.